Tax is not included and rates are based on double occupancy. An extra person costs $11.50 per night. If you will be arriving later or departing earlier than scheduled, please inform us in advance. If not, we will charge for the full amount of the initial reservation. Reservations may be canceled within 48 hours of arrival date. Management may charge a guest for any room that is not cancelled within the 48 hour time period. During peak season(s) a two night minimum stay is required. Sorry. We do not accept pets. Quiet hours are between 10:30 p.m. and 7 a.m. The front desk is open 24 hours. A fax service is available. Hotel corridors are interior hallways. 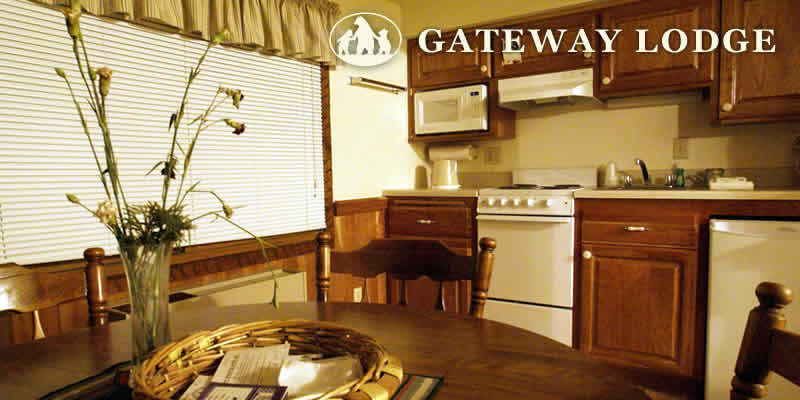 Gateway Lodge is an ideal location for all types of reunions. Call now to make your reservations. Our Front Desk is staffed 24 hours per day, 7 days a week for your convenience. Gateway accepts Visa, MasterCard, American Express and Discover.